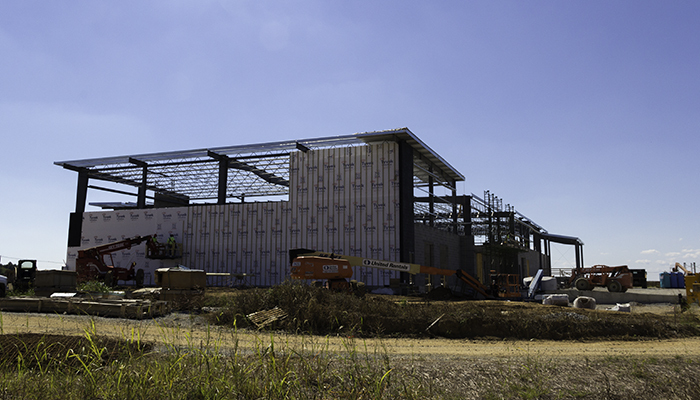 September 24, 2015 – Construction work is underway on the latest addition to Bardstown, Kentucky’s claim as the “Bourbon Capital of the World.” The Bardstown Bourbon Company’s distillery is being built on the town’s east side in the Nelson County Industrial Park, and work is progressing toward an opening in June of 2016. Bourbon Hall of Fame distiller Steve Nally is overseeing construction of the distillery, and will serve as master distiller once production begins. “We’ve had kind of a rough winter and a wet spring that kind of slowed us down a bit, but right now it looks like we’re on schedule,” he said in an interview. The $25 million dollar project will be the third in Bardstown and the fifth in Nelson County, and has been designed to serve as a showplace and education center as well as a distillery. “When people come in, we want them to leave thinking they have an idea of how it’s done…seeing product flowing through the lines, the still’s going to have a lot of glass in the front of it, so they’ll be able to visually see product coming down through the still,” Nally said. The distillery will also have a culinary center, but the most important recipe still has yet to be created. Nally plans to start working this winter on developing the mashbill for the distillery’s Bourbon, and plans to make something a bit different than what he made at Wyoming Whiskey and previously as Master Distiller at Maker’s Mark. “I don’t want to copycat either one of them…I’ll do similar, but different,” he said.